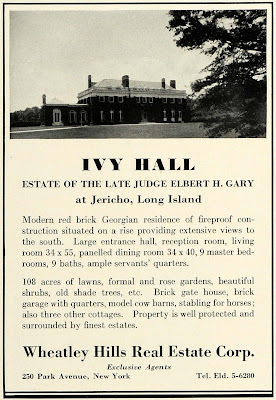 A 1931 advertisement for 'Ivy Hall', originally the Ralph Julius Preston estate designed by Warren & Wetmore c. 1904 in Jericho. Preston, an attorney, was deputy Red Cross Commissioner for Europe during WWI. Preston's wife Elizabeth was the daughter of William Payne Thompson of 'Longfields' in Old Westbury. In 1906 the estate was sold to James Blackstone Taylor, brother of Talbot J. Taylor of 'Talbot House' in Cedarhurst. Taylor was a partner with his brother in Talbot J. Taylor & Co., partner with Taylor, Bates & Co., and president of Cove Neck Realty Corp. He was also president of Upressit Metal Cap Corp. and founder and president of Upressit Products Corp. In 1920 the estate was sold to Elbert H. Gary, a founder and chairman of the board of U.S. Steel Corp. 'Ivy Hall' was demolished c. 1950 but click HERE to see where it stood on google earth. A 1904 house with nine en suite bathrooms. Or course Warren & Wetmore knew what they were doing & it's a good looking house; but something about the balustrade & roof, front & back, throws me off. It appears the house that sits there today doesn't want to be seen from the steet or by its neighbors (can't hide from Bing). I looked & don't see a single twig of ivy there today. A number of years ago, Sotheby's sold the most extraordinary solid gold dinner service that had been comissioned by Judge Gary from Tiffany and Co. and had apparently remained in the Gary family strong box since the Judge's death. It was surprisingly simple in design and not particularly appealing aesthetically, but was astonishing in it's breadth- dinner plates, various sizes of goblets and the usual jaw dropping assortment of specialized eating utensils one sees in services of its vintage. If I recall, the pieces were also monogramed with the single letter "G" rendered in a sort of tendril design. It was all terribly retrained and in "good" old lady taste. It made one pine for the more robust efforts that Tiffany extended for plutocrats of an earlier, perhaps less self consious era. If you are going to spend vast sums of money on a gold dinner service it should be required that it be unapologetically elaborate in design. While the house is nice enough, if you are going to the trouble to design a severely symmetrical main facade you should at least beef up the one chimney on the right that is much narrower than its counterpart on the left. They are too prominent a feature on the roofline not to be addressed in a similar fashion. Well, my pinko liberal democrat soul believes that if one has so run out of ways to spend one's money that one has to resort to Gold dinner services, it's time to rethink how little money one is giving to charity. But, my extravagant side believe that if one simply must have a gold dinner service, this isn't the one. Waaay too restrained. It's a gold dinner service for pity's sake. Ancient, many of the architectural and design journals of the era discussed bathroom needs. Ochre Court in Newport, perhaps the most lavish house of its year in America, had only four or five bathrooms, including one for servants, for fifty rooms on five floors. Marble House, built only a short time later, had seven master and one servant's bath for thirty rooms on four floors. So, obviously there were no hard and fast rules.